Marie Kondo breaks down her fundamental methods to approach tidying, check out a few of them here. When it comes to decluttering, we tend to tackle mess by rooms. Instead, the author suggests tidying by category which will keep things organised. For example, keep all your books together, as they continue to creep from one room to other. She advices to begin with clothes, then books and later with old photographs. While clearing the mess, you find many letters and photographers. Here the organizing consultant asks you to put blinders and focus only on the category, since the chances of going back in thoughts are high when you read an old letter from your closet. Gather all your clothes and put them in a giant pile. Ask questions and give yourself permission to let go of your clothes which are no more in use. You will end up in filling the bags this way. You can even give them away to the needy and feel lighter. Once you have sorted out the things to discard, you can decide where the remaining stuff will go. Also, Kondo asks people to fold them in a dresser instead of hanging them in a closet. 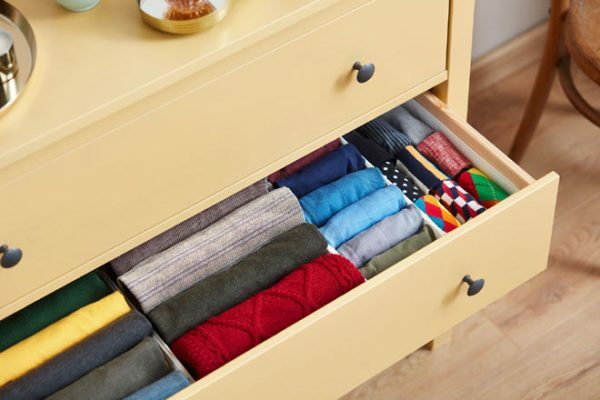 She even teaches a few techniques of folding clothes, and suggests using smaller boxes or shoeboxes as drawer dividers. Since we always choose easy-to-grab clothes, we end up wearing the same clothes on rotation. However, with this technique of decluttering, all your things will be organised and you can rediscover your style.